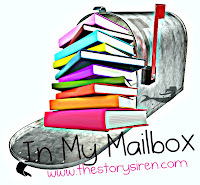 In My Mailbox is hosted by The Story Siren to showcase books you have recently acquired. Any can participate so check out her blog for more details. My list is very small this week. I adore the cover of Harbinger. So intriguing. Lots of Harbingers this week! I'm seeing Harbinger everywhere! I loved the trailer for that book. As soon as my book buying ban is over I need to get my hands on that one! :-) Enjoy! I can't wait to get my hands on Harbinger!! I hope you enjoy it! I would like to follow you, but there is no way to follow you....Harbinger looks awesome. I fell in love with the cover. Great selection of books. Come visit me. Harbinger looks and sounds really interesting. Enjoy your books. I read Embrace late last year and it was such a good book the whole witches thing it was awesome. I hope you enjoy everything you got this week. Here's my IMM!